Camo is making a comeback. We’re seeing it everywhere, from desert-style to jungle-style to Woodland-style to digital-style, on trousers by Calvin Klein, sweatshirts by Givenchy, and even ties by Dries Van Noten. It’s a wonder you could even see any of the models at the most recent men’s fashion week in Milan. All of the top designers had cloaked them in camouflage. If you feel that an entire piece of clothing in the print is a bit brave for your taste, an understated accessory can do the trick. The Dries Van Noten Camouflage Silk-Wool Jacquard Necktie is as classy as it gets and still adds a little edge to your outfit. The White Briefs’ Camo Print Cotton T-shirt is made from the same material as the Swedish brand’s undershirts, meaning it’s super comfortable and breathable. A camo tee is an ideal weekend look paired with simple, dark jeans and a cardigan sweater or jacket. You could even layer it under a crewneck sweater for just a peek of the print, ensuring you don’t go overboard. Smoking slippers are pure classics, but no one said you can’t have a little fun with them. These Del Toro Green Camo Perforated Slippers are sure to be in your wardrobe for years to come, regardless of whether or not you decide wear them outside the house. Another way to show just a sliver of camo? The Carhartt WIP Long Sleeved Buster Shirt. It’s all business on top with a little bit of party on the bottom. Wear it with khakis, chinos, or your favorite pair of jeans. Believe it or not, your gym wear is a great place to experiment with new patterns and colors before you bring them into your regular wardrobe. (After all, it’s not like your office buddies are following you into your sweat session.) These Under Armour Rival Fleece Joggers are perfect for heading to and from the gym on colder days, and the somewhat abstract version of the camouflage print makes them less loud. Spruce up your sport coat. 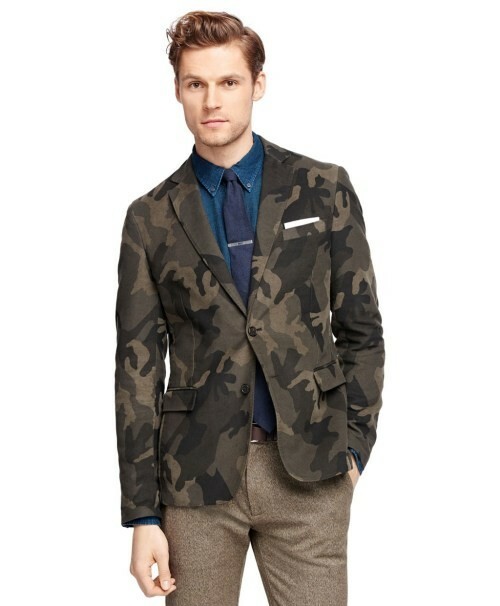 If you feel completely comfortable making a statement, check out the Brooks Brothers Camo Sport Coat. (Brooks Brothers!) It works pairs well with pretty much any neutral pant and button down, and is sure to get an admiring comment or two whenever you wear it. Wearing camo sneakers, like these special edition New Balance Age of Exploration Distinct Collection ones, is one of the easiest ways to incorporate the pattern into your existing style. With almost no effort at all, you can switch your regular trainers for these updated ones for a fresh, on-trend look. The best thing about the Woolrich Reversible Camouflage jacket is that if you’re not loving the print with what you’re wearing, all you have to do is turn it inside out. Maybe you’re heading from a business meeting to drinks with the guys and you want to change your look depending on who you’re with. This versatile style can be both sporty classic and casual cool. A weekend duffel is a piece you’re going to want to have forever, so the Ralph Lauren Camo Suede Weekender Duffel is a wise investment. Though wearing a sweatshirt out on the town can be difficult to pull off when you’re in your 40s, the Valentino Camouflage Crew Sweatshirt is appropriately trendy and has just the right amount of flair. This Coach Apple Watch Wild Beast Camo Leather Strap is a cool way to make your tracker stand out, and you can always switch back to a metal or plain leather band when you get tired of it or have to attend an event that’s more formal. A field jacket is the quintessential camo item, but an all-over print can feel like overkill when you’re trying to go for a more sophisticated look. The Belstaff x Sophnet Nylon Roadmaster Jacket features a mostly solid waxed canvas exterior, but the underarm lining and elbow patches provide some great pop.